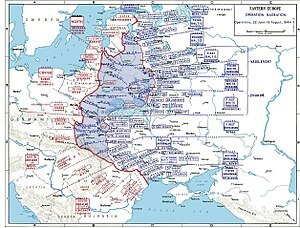 Operation Bagration (/bʌɡrʌtiˈɒn/; Russian: Операция Багратио́н, Operatsiya Bagration) was the codename for the Soviet 1944 Belorussian Strategic Offensive Operation, (Russian: Белорусская наступательная операция «Багратион», Belorusskaya nastupatelnaya Operatsiya Bagration) a military campaign fought between 23 June and 19 August 1944 in Soviet Byelorussia in the Eastern Front of World War II. 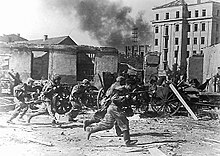 The Soviet Union inflicted the biggest defeat in German military history by destroying 28 out of 34 divisions of Army Group Centre and completely shattered the German front line. a The exact casualties of the German forces during Operation Bagration will never be known, as not much research has been done on this subject. 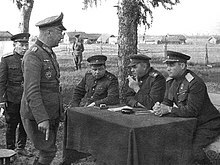 Wartime Soviet estimates claim 539,000 German overall casualties (including 158,000 captured). Western estimates put German casualties lower at about 300,000 – 350,000 men. 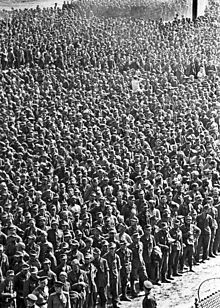 Newer research done by the MGFA and led by historian Karl Heinz Frieser put German casualties at 399,102 soldiers. ^ Zimmerman (2015), pp. 275–281. 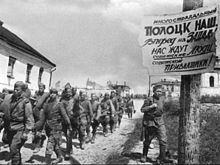 ^ "Operation Bagration: Soviet Offensive of 1944 | HistoryNet". 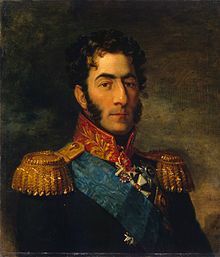 www.historynet.com. Retrieved 12 February 2018. Zimmerman, Joshua D. (2015). The Polish Underground and the Jews, 1939–1945. London, New York City: Cambridge University Press. ISBN 978-1108432740. This page was last edited on 16 April 2019, at 00:04 (UTC).